Photos : Copyright &COPY; 2006, fashionfreak. All rights reserved. In 2005, PRET A PORTER PARIS® celebrated 100 years of the Entente Cordiale by revisiting that iconic British garment, the trench coat, in the exuberant freshness of living gardens set right at the heart of the exhibition. 2006 sees another landmark - 120 years of Franco-Korean friendship. For PRET A PORTER PARIS® this was the perfect opportunity to raise awareness of the hanbok, a traditional Korean costume, and to offer a fascinating re-interpretation of this garment for our times. With support from the Korean Ministry of Culture and Tourism, nine designers stayed in Seoul from 2 to 7 April 2005 where they immersed themselves in the ancient traditions of the Land of Morning Calm. Their brief was to come back and create their personal, entirely free reinterpretation of this highly formalised traditional garment. The designers: Gaspard Yurkievich, Gustavo Lins, Hannoh+, Jean-Paul Knott, Laurent Mercier, Marc le Bihan, Moloko, Sandrine Philippe and Thibault van der Straete. The result of this cultural exchange was an exhibition of around fifty creations reflecting highly original creative interpretations - stunning hybrid garments that will grace the future hanbok museum in Paris. Simultaneously, some fifteen brands and designers exhibiting at the show undertook a similar design project. 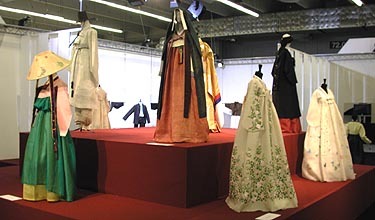 Historic hanboks and hanboks by contemporary Korean designers were displayed in counterpoint to the creations inspired by them. This exhibition will also be shown in Pusan - the city which hosts the International Film Festival - and Seoul. Adrien Gardère - the designer selected to renovate the Museum of Islamic Arts in Cairo, and a seasoned designer of sets for trade fairs - has opted for an intuitive, accessible design: elegant, light-hearted and romantic. The structure of a spectacular giant hanbok is mapped like a banner in the space, with a design picking up on key features of this garment: the layering of fabrics, the openings and transparencies. And on its traditional colours - ecru, white, black and dark red. Within the space, pathways clearly separate the historic garments from the contemporary creations. The hanbok is a traditional Korean clothing which exists already for centuries. Within the different historical periods of Korea the appearance of the hanbok was subject to many changes. Influences came from China, Mongolia or Korean rulers. Today, the hanbok consists of a wrapped long skirt ( chima ) and a short jacket ( jeogori ), bolero like, both with no pockets. The Fair of "Fashion Universes"